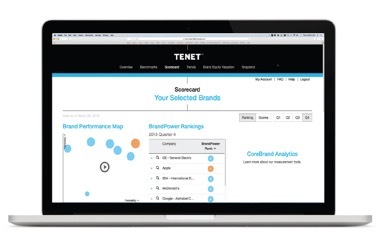 Tenet Partners, a leading brand innovation firm, announced the release of its Brand Performance Dashboard. This on-demand platform provides companies and their agency partners with instant desktop access to valuable KPIs to measure the success of corporate branding initiatives. Tenet brand image, reputation and financial metrics provide important leading indicators to round out many of today’s corporate balanced scorecards. With over 22 years of consistent brand image data for 1,000 companies, this leading-edge platform provides leaders with a comprehensive view of their corporate brand. Through continuous tracking each year, brand image and reputation data is captured through rigorous telephone interviews among 10,000 influential consumers and business decision makers. Using a unique blend of data analytics and strategic consulting, this new solution gives management unrivaled, real-time access and insight to transform their brand, traditionally treated as an intangible asset, into a company’s foremost tangible asset – one that can be measured, shaped and managed to deliver greater value. The Brand Performance Dashboard is a highly flexible platform that can be customized specifically to measure a client’s brand against its competitors and/or peers. Measured nationally in the US, the Dashboard can be further customized to include additional target audiences, image attributes and regional and global perspectives. In combination with Tenet advisory services, including custom research, analytics, and brand strategy, companies can strengthen the performance of their corporate brand and create competitive advantage. Underscoring the critical importance of Tenet CoreBrand Data, it is the underlying component in the BrandTransact Index® (BTW50_). The _BTW50 is the first brand-based Index combining brand value metrics with Wall Street analytics to create a rules-based methodology, identifying companies whose share value is not fully recognized in the US markets.